Don’t let the half marathon crazies knock your confidence. When you get to the last 2 or 3 weeks of training before your half marathon, the tendency is to panic and question yourself. Did you do enough? Is that injury from a few weeks ago going to flare up? What if this happens? Or that happens! Instead, what you should do is stay confident in your training, keep everything as normal as possible, and relax. Knowing that you’ve done everything you could have and what’s done is done should calm you down and keep your mind at ease. When it’s time to get into those last 15 days here are three things you can and should do to start your taper. Bring your mileage down slowly. Don’t drastically cut out miles or the days you run. Depending on your highest weekly mileage will depend on how much you cut back. You’ll still want to do your workouts, like tempo runs and threshold repeats, but instead of running full volume, do 50-75% of the distance. On the reverse end, don’t try and cram miles in because you missed a few days a month ago. What’s done is done. Eat less, but eat healthily. You’re running less mileage, so you’re burning fewer calories. Don’t starve yourself but know you don’t need the same calories you needed when in heavy miles. Eat good-for-you meals, smaller portions, and more often. Get lots of it. Now is the time to rest up and restore your glycogen stores and rest your body. There’s no sense going to that party, getting run down and coming down with a cold, is there? A cold right before your big race can pretty much assure you that you won’t run at 100%. 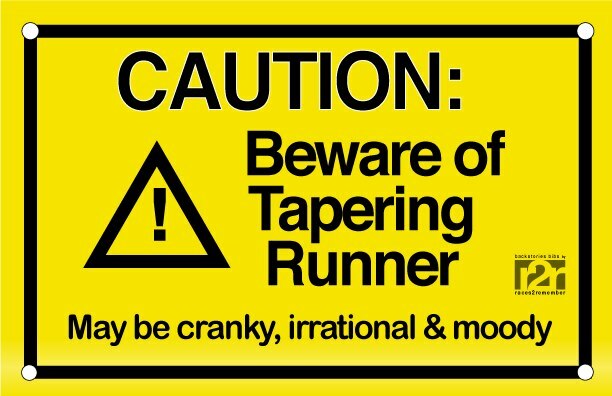 There are lots of ways to properly taper for a race, and there are some really good myths about tapering. Make sure you use sound judgment and when in doubt, back off with the training. Best of luck in your quest for a PR!